This lists the latest Peals and Quarter Peals achieved by the Royal Naval Guild of Bellringers and will eventually list all the peals completed by the RNGB, including two which were achieved before the official formation of the Guild. Rung by members of the RNGB and guest ringer Clive, in memory of Vice Admiral Sir Barry Nigel Wilson KCB, past president of The Guild. On the 31st of May 1916, the British and German fleet’s met for what became known as the bloodiest Naval Battle in British history, with over six thousand British and two and a half thousand German deaths by the end of the day. This was the only major naval engagement of the First World War and controversy has surrounded its outcome ever since, with no clear winner or loser. 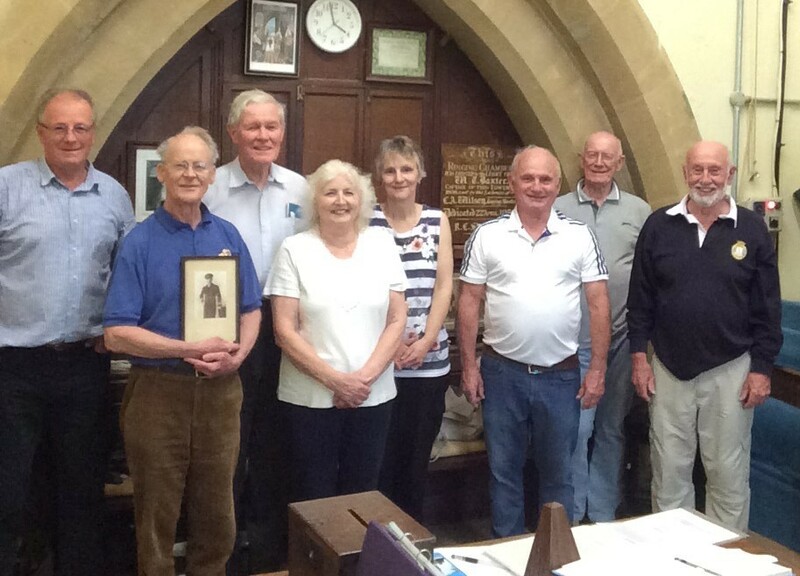 It was thought appropriate that the Royal Naval Guild of Bellringers should mark the centenary, so we met for a quarter peal day in Wiltshire, that being a central location for those travelling. 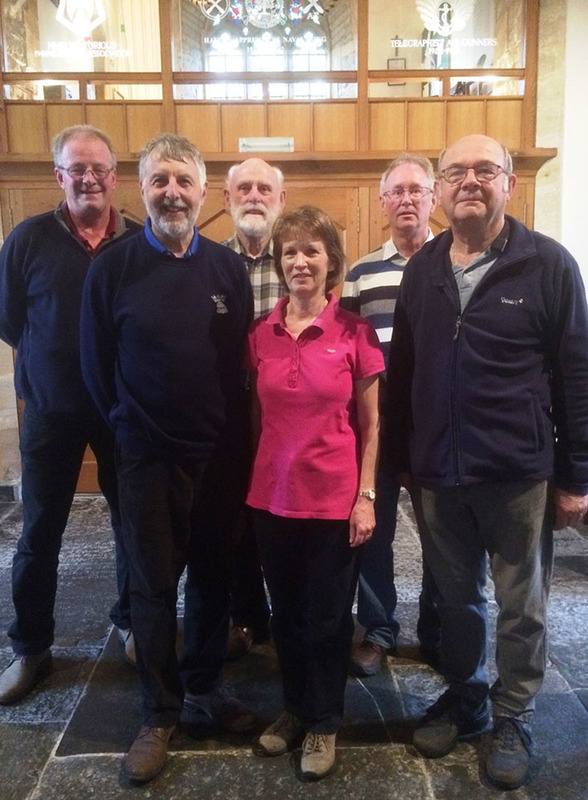 Respectable quarters were rung at Bishops Cannings and at Calne, with a final ring at Royal Wootton Bassett. Thanks to Hungerford ringer Dave Thorpe for standing in at short notice. COMMANDER J.G.P. INGHAM DSO ROYAL NAVY (above), uncle of James Ingham (Captain Royal Navy retired) was Executive Officer of HMS WARRIOR at the battle. HMS WARRIOR, a cruiser of 13,550 tons, was heavily damaged in the battle and was taken in tow by HMS ENGADINE who transferred her surviving ship’s company. She was very low in the water and later, in a rising sea, she was abandoned and sank. Commander Ingham retired in the 1920’s and was recalled to further service in 1939. 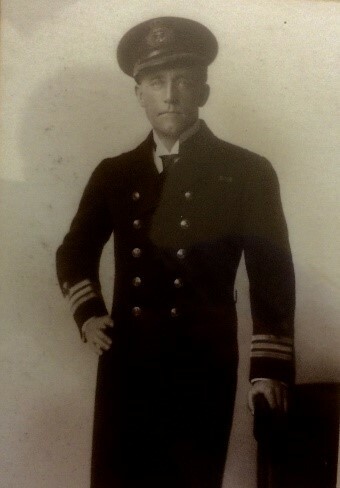 Anna Gawley’s Great Grandfather Frederick Brookes, joined the RN in 1904 on his 18th birthday. He went from shipyard riveter to signal boy and on to become petty officer. From 1912 until the end of the war, he was in HMS COCHRANE and was at the Battle of Jutland as a leading signalman. HMS COCHRANE was a Duke of Edinburgh class cruiser of 13,550 tons and was in the Second Cruiser Squadron, commanded by Captain Eustace La Trobe Leatham. Leatham's account of the proceedings states that for much of the battle, she was in line behind HMS MINOTAUR with her visibility obscured by MINOTAUR’s funnel smoke for practically the whole of the action, so did not engage the enemy. In 1918 she broke in two when aground in the River Mersey and was broken up in situ. Fred was demobbed in 1919 becoming a motor engineer's clerk at what would have been Thorneycroft in Basingstoke. He died in 1929 of cancer aged only 43. The weather for the day was perfect, sunny but not hot with a good breeze. 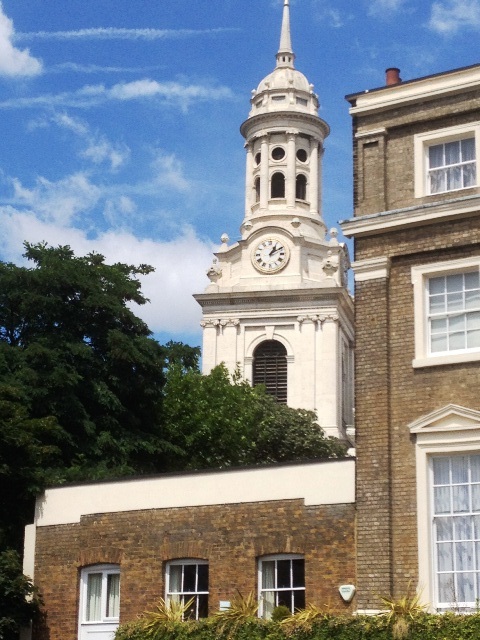 We all met early at St Alfege, Greenwich, in an area buzzing with visitors, school trips and amidst concert practice in the church. Joan was accompanied by Christina McGilligan-Fell, director of the John Harrison Foundation, and we were told that Officials from the nearby Royal Observatory were also aware of our visit and had come to listen, so no pressure on us! We got going promptly and rang a very good quarter of Grandsire Triples on the back 8 of this majestic and lovely sounding 10. The ringing was a credit to the band. 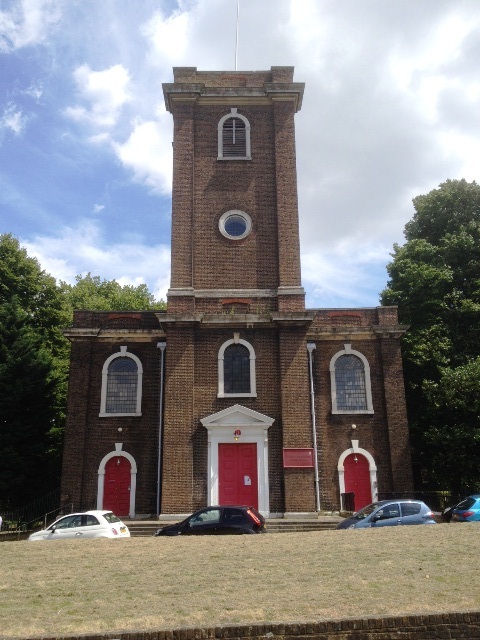 We then proceeded to the Meridian Ringers local pub, the Ashburnam Arms, to an excellent lunch and then on to St Michael, Woolwich. This 12 cwt 8 went ok but the trebles were difficult to hear amidst the back bells. Jenny unfortunately fell and hurt her shoulder on our way to lunch, so felt unable to ring and was replaced by our host Graham, of the Meridian Ringers, who kindly agreed to stand in. We started with Plain Bob Major but it was clear after a few minutes that it wasn’t going to go, so we switched to Plain Bob Triples. We were more successful with triples and, although not without incident, scored the quarter. Then, after farewells, we all headed off home with an enjoyable day behind us. 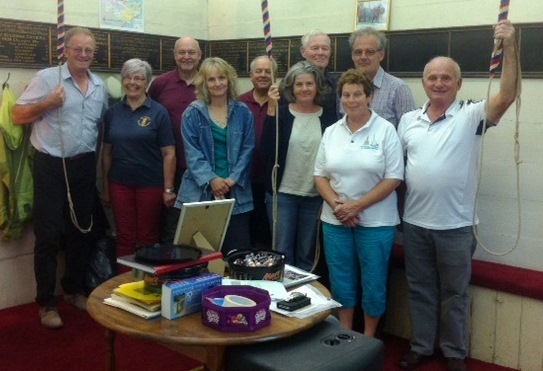 A particular thank you is due to Graham Long of the Meridian Ringers for the arrangements, hosting us so well and stepping in to ring at short notice. To mark the 300th Anniversary of the Act of Longtitude, enacted 9th July 1714. 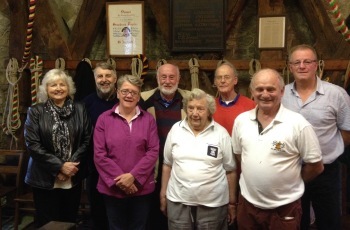 Rung on the back eight, by members of the Royal Naval and Royal Air Force Guilds of Bellringers and guests. Also present: Christina McGilligan-Fell, Director of the John Harrison Foundation. Rung to mark the 300th anniversary of the Act of Longtitude, enacted 9th July 1714. A birthday compliment to Graham, and thanks to him for stepping in at the last minute, when one of the band was indisposed. Rung by a combined RN, Army and RAF Guilds band to mark the centenary of the first peal by an all Armed Forces band, Plain Bob Major, rung at Gillingham on January 8th 1914.